A century ago, President Theodore Roosevelt called for and held a White House Conference on Children. One hundred years later, public policy to improve the well-being of children has progressed significantly. However, continued steps are needed, to ensure all of our nation’s children are prepared to live up to their full potential. 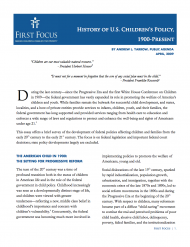 Therefore, First Focus has released a comprehensive history of federal child policy during the last century. The publication, written by Andrew Yarrow of Public Agenda, surveys federal legislative, executive, branch, and judicial actions impacting America’s children from Teddy Roosevelt and the Progressive Era to the first month of the Obama Administration. The Publication touches on issues of child welfare, education, child and family health, children’s rights, and others.